Oh, Tom Cruise. How did you become such an Action Hero? I know! It’s because you pump your arms so much when you run! And for Mission Impossible: Rogue Nation, you upped the ante and taught your running technique to your co-stars! When you and your (female ) British Intelligence counterpart run side by side, you look like twins! Superfast, Olympic calibre twins! By now, we know that the “Mission: Impossible” title is a misnomer. Because as confirmed in this movie, the Impossible Mission Force has a 100% success rate! 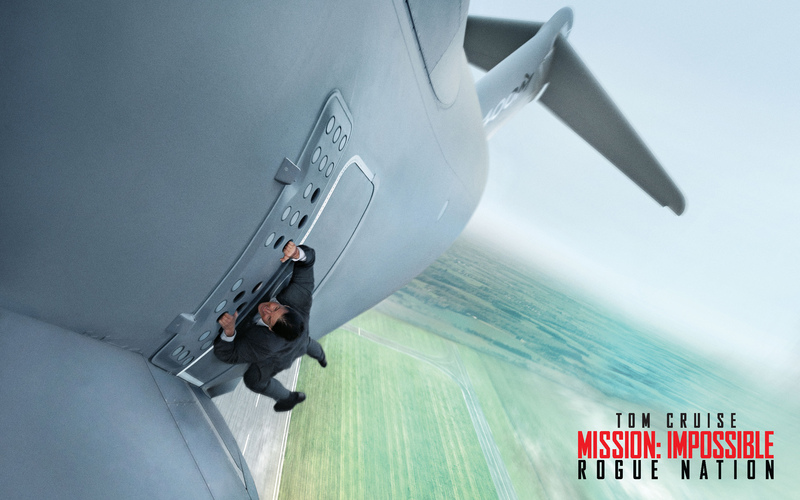 I think we need to start a petition to change the name of this franchise to “Mission Difficult”, especially since a byproduct would be that Tom Cruise couldn’t make the same joke in his promos for the now-inevitable sixth movie, i.e., “This isn’t Mission Difficult…”. This time that quote referred to him hanging off a plane, which i heard about more than probably any single stunt ever. And honestly if there hadn’t been so much hype I might have forgotten that scene altogether by now, because it has nothing whatsoever to do with the rest of this movie! So to me it just came off as Tom Cruise trying too hard to prove he is an Action Hero, and set that tone for the rest of the movie (and it’s the opening sequence). Despite all that, I enoyed Mission: Impossible – Rogue Nation. It’s well executed, keeps moving, and doesn’t have any glaring plot holes or overly ridiculous contrivances (as long as you accept that Ethan and Luther and Benji and Jeremy Renner all can immediately do anything needed to bring a plan into effect, and I’ll give them that one here). It’s a decent summer movie. Nothing more, nothing less. But if you’re at or near your limit for Tom Cruise tolerance, you might want to skip this one, because in Mission: Impossible – Rogue Nation, he is at his Tom Cruiseiest! I give Mission: Impossible – Rogue Nation seven rubber masked impersonations out of ten. This entry was posted in Movie Reviews and tagged action movies, Alec Baldwin, blockbusters, Half-assed, Jeremy Renner, Rebecca Ferguson, simon pegg, Tom Cruise, Ving Rhames on August 9, 2015 by Sean.